Hello, Connie Nichol here today with a simple card using up odds and ends that were lying around my craft area. I send these Hope cards to friends and family struggling with serious disease. Usually it's cancer. Such an awful thing to deal with. I folded a black card base and glued on bits of ribbon, patterned paper, book pages and even a scrap of Magic Mesh I found lying about. I don't think they make Magic Mesh any more, but you can use drywall tape in a pinch if you want a meshy look. Drywall tape can be coloured by dabbing it with any kind of ink and a roll will last you forever. Cut or tear some of the ends of the strips to add a little more interest. 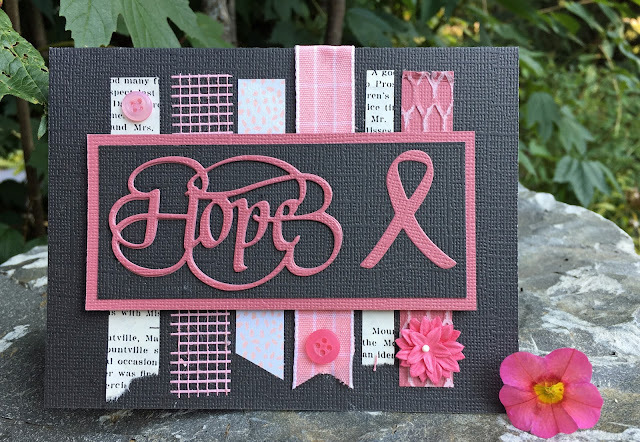 Die cut hope and the ribbon with the metal cutting dies out of pink cardstock, mat and adhere on top of your strips. The dies are available from Elizabeth Craft Designs, or here in the Quietfire Design store.